The affair was planned in large part by the vivacious First Lady, Abigail Adams, and was considered a great success. A small orchestra played festive music in a grand ballroom adorned with seasonal flora. After dinner, cakes and punch were served while the staff and guests caroled and played games. The most amusing incident of the evening occurred when one of the young guests accidentally broke one of the First Granddaughter’s new doll dishes. Enraged, the young guest of honor promptly bit the nose off of one of the offending friend’s dolls. The amused president had to intervene to make sure the incident didn’t take an even uglier turn. John Adams was born into an early colonial family on October 30, 1735. His father was a farmer, deacon, and town selectman who attended Harvard University and made sure that his son was well-educated from a young age. Young Adams entered Harvard in 1751 at the age of 16 and graduated in 1755. He decided to study law and was admitted to the bar in 1858 after a clerkship with a prominent Worcester firm. He married Abigail Smith, a strong, well-liked, and intelligent woman, in 1764. 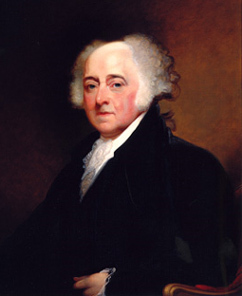 Adams frequently sought the advice of his wife on many matters, and their correspondence was filled with intellectual discussions on government and politics. The couple would have six children. Seven weeks after Christmas of 1762, the Treaty of Paris ended the French and Indian War, with England’s victory establishing it as the dominant colonial power in America. Adams first rose to prominence in the late 1760s with his public writings and speeches against Britain’s policies regarding its American colonies. Shortly before Christmas of 1768, King George sent 4,000 troops to Boston in response to colonial protests against taxation. This occupation led to the Boston Massacre in 1770 in which British soldiers fired into an angry crowd, killing five colonists. Adams gained further acclaim when he represented the soldiers involved in the massacre. During this time, public outrage over the incident was at an all-time high. 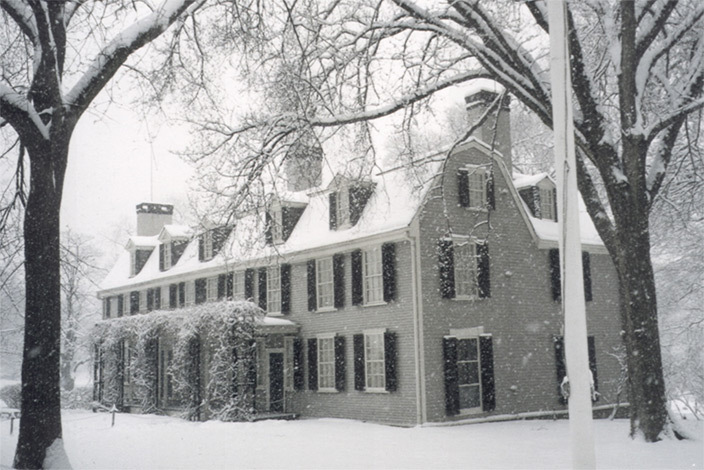 It is safe to say that no Christmas cards were being exchanged between the colonists and the British government. Adams feared his career would be ruined but felt that it was important for all individuals to have a fair trial with the best possible representation. The trial ended with six acquittals and manslaughter convictions for two of the soldiers. Tensions continued to grow as the Boston Tea Party took place nine days before Christmas of 1773. Between 1774 and 1778, as the colonies’ dispute with the Crown exploded in violence, the government of Massachusetts sent John Adams to Philadelphia as a delegate in the First and Second Continental Congresses. Adams became one of the leading advocates of separation from Great Britain and nominated George Washington to be the leader of the Continental Army. Two weeks after Christmas of 1775, Thomas Paine further stoked the colonists’ independent spirit by publishing Common Sense, which urged the taking up of arms against an oppressive government. Adams was selected to serve on the committee that wrote the Declaration of Independence. While largely written by Thomas Jefferson, Adams and Benjamin Franklin both reviewed the document and made their own changes. On Christmas Day of 1776, George Washington crossed the Delaware and scored an important victory, capturing over 900 Hessian troops at Trenton. During the Revolutionary War. Adams served as a leading diplomat in France and then Holland, with his second mission resulting in the securing of important loans for the fledgling nation. He was appointed to be the first U.S. Ambassador to Great Britain a few years after the war’s end. Peacefield, John Adam’s Quincy, Massachusetts farm, where he spent several Christmas holidays with his family following his presidency. Adams wrote the Massachusetts State Constitution and advised on the writing of the U.S. Constitution in 1787. Two years later, in the first U.S. presidential election, he finished second in the Electoral College to landslide winner George Washington and was named the first Vice President of the United States. As president of the Senate, Adams cast 29 tie-breaking votes on various bills – a record which still stands today. In 1796, when Washington decided not to run for a third term, Adams was nominated as the Federalist candidate for president. He won a narrow victory over his friend and sometimes-rival, Thomas Jefferson. The tally was 71 to 68 in the Electoral College, made official before Christmas of 1796. Jefferson became Vice President. England and France were at war and a rift formed between the Federalists, who favored the British, and Jefferson’s Democratic Republicans, who preferred the French. As president, Adams built up the U.S. Navy and oversaw the “Quasi-War” with France (a violent series of naval engagements between the two countries). If the sending of White House Christmas cards had been in practice at the time, it is fair to assume that none would have been sent to the leaders of France. President Adams signed the controversial Alien and Sedition Acts, which proponents claimed were designed to protect the U.S. from alien citizens of enemy powers and to stop rebellious actions from weakening the government. But political opponents, and later historians, attacked the acts as being both unconstitutional and designed to stifle criticism of the administration. As president, Adams also ended the dangerously escalating situation with France through skilled diplomacy. While devastated by the loss of his beloved Abigail in 1818, Adams lived long enough to see his eldest son, John Quincy, ascend to the presidency. Until the recent administrations of George and George W. Bush, the Adams stood as the only father-son tandem to ever become president. The long-running friendship between Adams and his onetime rival, Thomas Jefferson, came to an end when both men died within hours of each other on July 4, 1826 – the 50th anniversary of the signing of the Declaration of Independence. At 90 years and 247 days, Adams held the record as the longest living president for over 175 years, until Ronald Reagan surpassed him in 2002. Though not as famous as his contemporaries Washington, Franklin, and Jefferson, John Adams is held in high esteem by historians for the crucial role he played in founding the nation and guiding it through its formative years. Sounds like the White House wasn’t such fancy digs in its early days. I love the story about the pint-sized rivals at the Christmas party. anybody see that HBO miniseries? they reran it not to long ago. fourth of July weekend, I think…? it’s really good. I love stories about the way things were. Good to know they held holiday festivities before the White House was officially the White House. I’m sure it was a much more casual occasion back then.